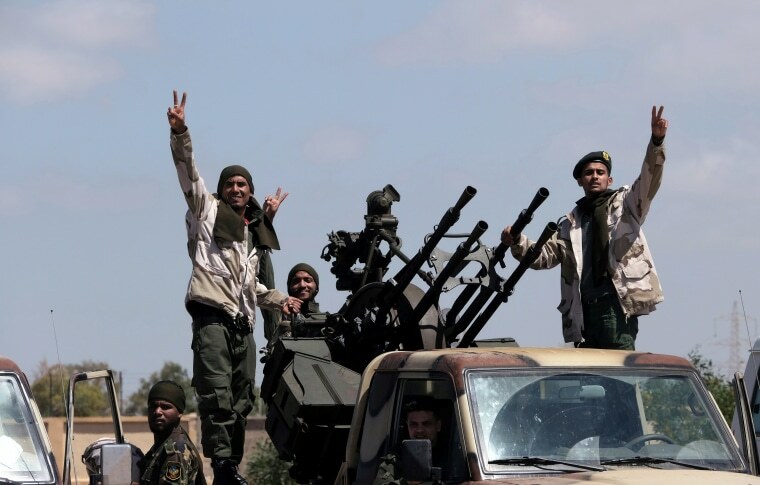 BENGHAZI, Libya — The United States has temporarily withdrawn some of its forces from Libya due to "security conditions on the ground," a top military official said Sunday as a Libyan commander's forces advanced toward the capital of Tripoli and clashed with rival militias. A small contingent of American troops has been in Libya in recent years, helping local forces combat Islamic State and al Qaeda militants, as well as protecting diplomatic facilities. Fayez Sarraj, head of government in Tripoli, accused Hifter of "betraying" him. "We have extended our hands towards peace, but after the aggression that has taken place on the part of forces belonging to Hifter and his declaration of war against our cities and our capital ... he will find nothing but strength and firmness," al-Sarraj said Saturday in televised comments. Sarraj and Hifter held talks in Abu Dhabi in late February, their first confirmed meeting since November 2018, when they agreed that national elections were necessary, according to the U.N.
Hifter is seeking to capture the capital and seize military control of the whole country before U.N.-sponsored talks due to start next week that were designed to set a time frame for possible elections in the oil-rich country. The U.N. envoy for Libya, Ghassan Salame, said the U.N. is determined to hold the planned conference. Secretary of State Mike Pompeo urged Libyan factions to return to negotiations, saying that "there is no military solution to the Libya conflict." "We have made clear that we oppose the military offensive by Khalifa Hifter's forces and urge the immediate halt to these military operations against the Libyan capital," Pompeo said in a statement. Fighting was underway Sunday at the international airport, some 15 miles from central Tripoli, after Hifter claimed to have seized the area. The airport was destroyed in a previous bout of militia fighting in 2014. Hifter said his forces had launched airstrikes targeting rival militias on the outskirts of Tripoli. Armed groups behind the U.N.-backed government of national accord, or GNA, have announced an effort to defend Tripoli, vowing to recapture all areas seized by Hifter's forces. Col. Mohamed Gnounou, a spokesman for GNA forces, said in televised comments Sunday that the counteroffensive, dubbed "Volcano of Anger," was aimed at "purging all Libyan cities of aggressor and illegitimate forces." The fighting has displaced hundreds of people, the U.N. migration agency said.